1 Rub the inside of the caquelon ( traditional fondue pot) or deep flameproof pan with the cut sides of garlic halves. If desired, you can then chop the garlic finely and place it in the pan. 2 Mix the arrowroot or potato starch with 2 tablespoons of white verjus in a small bowl. Set aside. Pour the rest of the wine into the pan. 3 Heat the verjus very slowly. Add about a third of the sliced or grated cheese, and continue heating the mixture, stirring until the cheese starts to melt and the liquid to bubble. 4 Gradually stir in the arrowroot or potato starch mixture, then the rest of the cheese, a little at a time. Add the Kirsch pepper. 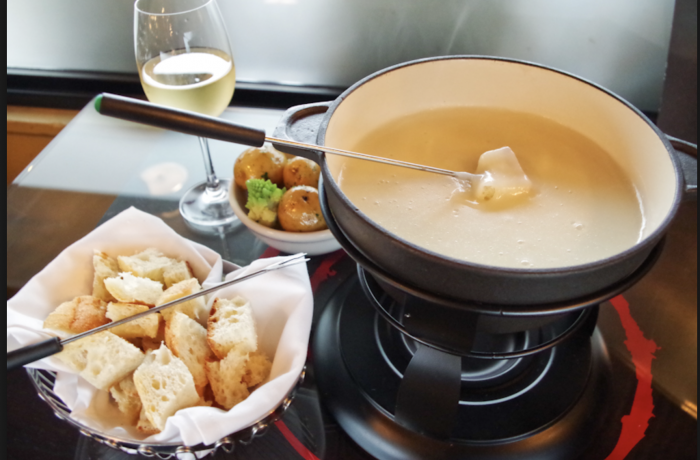 Place the fondue over the candle warmer on the table, with cubes of bread for dipping.